15. How Do You Think I Feel? 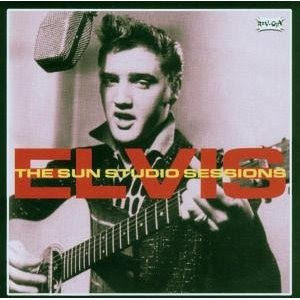 Definitely better than any of the regular studio albums by Elvis, the Sun sessions capture some of the fire and verve of Elvis at the very beginning of his career, it all went downhill from here as far as I'm concerned. A very interesting thing about this album is just how close to country music Elvis really is, for the most part it sounds like a country album with infused blues, with some more obviously rock tracks like Good Rockin' Tonight. A very strong influence from Doo-Wop is also present, although without the harmonies, obviously, but defining Elvis' beginning as purely rock would be wide of the mark. As a country artist he is great, as a rock artist not so much... you had better rock artists, with more fire than him, only they were the wrong colour to reach his popularity at the time. We will have them here in the best of section soon, though. The single "That's All Right" did not chart in the United States when released in 1954, and it was never issued as a single in Great Britain during Presley's lifetime. In 2004, the song became the focus attention when it was the subject of a great deal of publicity because of the 50-year anniversary. There was a special ceremony on 6 July 2004 featuring Isaac Hayes, Justin Timberlake, Moore which was beamed live to 1200 radio stations. The song went top 5 in the UK and Canada and also charted in Australia. The Sun Sessions was also re-released in 2004 (in Japan only) to celebrate the anniversary. hey, did you know there's already the new 3rd edition of 1001 albums? Wow! i'm surprised! This is first you finally made positive review on Elvis in this record! you use to hate Elvis and wrote negative reviews on his previous studio albums (Elvis Presley, Elvis is Back, From Elvis to Memphis)! Anon: Indeed! I quite liked it! I was surprised myself! Anon2: Is there somewhere I can find the new albums?